On April 8, ZValley announced the signing of Memorandum of Understanding（MOU）with Malaysia's Trans Elite Group Sdn Bhd. Mr. Xiong Yanming, Vice President of Zoomlion, and Dato’ Sri Tan Chia Lai , Chairman of Trans Elite, jointly attended the signing ceremony. 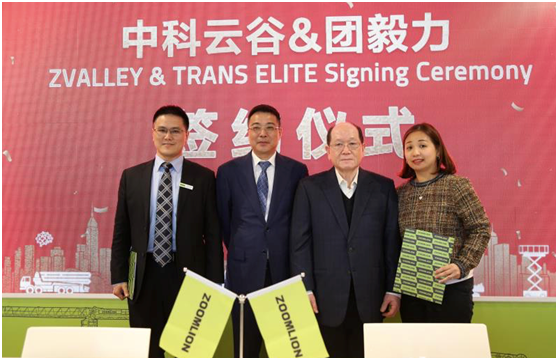 Mr. Yang Hui, VP of ZValley and Mrs. Evelyn Tan, Director of Trans Elite signed the MOU on behalf of respective side. According to the MOU, the two companies will work together in Malaysia in the fields of equipment condition analysis, equipment safety operation, market analysis, equipment rental management and new business development, leveraging the overseas operation of Zoomlion and the advantages of ZValley in Industrial Internet of Things (IoT), big data, and Artificial Intelligence (AI). The signing of this MOU marks the beginning of the exploration and expansion in overseas market by ZValley, which has accumulated solid expertise and first-hand experiences in China in turning new technologies into customer productivity and safety. ZValley will continue to carry out its mission of "Making IoT available to industries", and empower overseas customers to reduce cost, improve efficiency, ensure safety, and create new business model to maximize customer value. 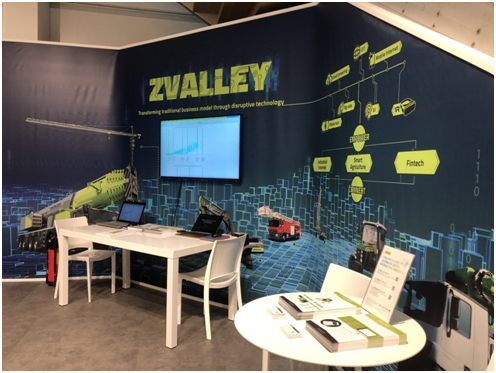 On Bauma 2019, the world’s leading construction machinery trade fair held during April 8-14, ZValley Co., Ltd. also demonstrated two IoT applications for overseas construction machinery customers, “Z-Asset Management” (“ZAM”), a smart equipment management tool, and “Z-Rental Management” (“ZRM”), a rental management tool. These IoT software can be used as Software-as-a-Services (SaaS) which is enabled by ZValley’s industrial AIoT (artificial intelligence and IoT) cloud platform “ZValley OS”, or can be deployed on premise, based on the customer and regulatory needs. ZAM is a smart equipment management platform serving construction machinery customers, which can be accessed via mobile devices and PC. By using Internet of Things (IoT) and big data analytic, ZAM empowers customers to do equipment management, project management, equipment health management, parts ordering, and service management from one-stop platform. It unleashes the power of equipment data, offers customers greater insights in operations, and aims to reduce equipment cost, improve efficiency, and improve profitability for customers. ZRM is a best fit for medium and large-scale rental companies. It can be used on both mobile devices and PC. Combining the advantages of Internet of Things (IoT) and Information Technology (IT), ZRM helps rental companies better manage their assets and contracts in a more efficient way, by offering them greater insights in equipment location, condition, and in rental contract execution. Trans Elite Group Sdn Bhd was incorporated in Malaysia on 11 November 1988 with principal activities being repairs, trading and rental of cranes for Heavy Lifting, Machinery Installation and Erection of Container Cranes. From its humble beginning, the Company has accumulated a wide range of experience to become an expert crane service provider known for efficiency and reliability. With over 30 years of track record, the Company has completed numerous rigging and heavy lifting projects for Oil & Gas Refineries, Petrochemical Plants, Power Stations, Civil and Industrial Engineering sectors. Among notable projects which the company had participated in included the Reactor Installation at Shell Oil and Gas Refinery, Container Crane Erection in Westport, Port Klang, Port Tanjung Pelepas, Johor and Penang Port, as well as the launching of beams for the Kuala Lumpur Monorail, Drier Erection for the MTBE project in Kuantan, the Lifting of a 90 tonnes & 300 tonnes Tunnel Boring Machine for the LRT project & Smart Project, the Lifting and Positioning of Convection Modules for the EMSB project in Kerteh and the Lifting of a 200 Tonnes Beam in Butterworth for the heaviest pedestrian bridge in Malaysian history. Founded in 2018, ZValley is the Industrial Internet company of Zoomlion, China’s leading engineering and agricultural equipment manufacturer. ZValley’s team consists of top technical experts, professors, executives, and operating talents from the world’s top technology companies, universities and large SoEs. ZValley currently has 200+ employees, out of which 80% are technical and R&D staff, and more than 30% hold master or doctoral degrees. 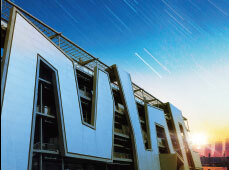 Building upon Zoomlion’s domain expertise in both equipment and IoT/data science for more than a decade, “ZValley OS”, the industrial AIoT platform of ZValley, is connecting more than 200,000 equipment of different kinds with a total value of more than 100 billion RMB, spanning over 9,000 data parameters and at a PB data volume level, and is turning data into insights and value every day. With a strong focus on manufacturing and agriculture related industries, ZValley is committed to helping people in those industries improve efficiency, reduce cost, and innovate new business models by unleashing the power of industrial IoT, data science, and AI.